This post contains affiliate links. That mean if you buy one of the recommended products the MouseQuest get a small commission to help defray our costs. When I think about participating in a runDisney race, I can’t help but get excited! The entertainment, the scenery, the characters, what could be more fun than racing through Disney parks? Crossing the finish line and getting that well deserved medal is exhilarating! So much hard work, perseverance and dedication goes in to achieving such a big goal. Although, getting there requires a little bit more than lacing up your shoes and hitting the pavement. In addition to a training plan, a packing plan is also needed to ensure a successful race day. Preparing for a runDisney race may seem like a no-brainer. For the most part, running really only requires a good pair of shoes and some disciplined training. However, there are several other items you may need to get you to the finish line. 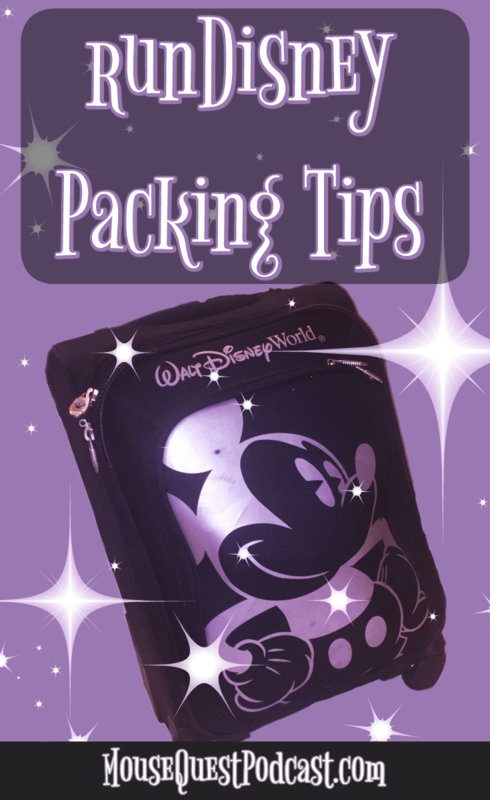 Here are some packing tips and ideas to help you make the most of your runDisney event. 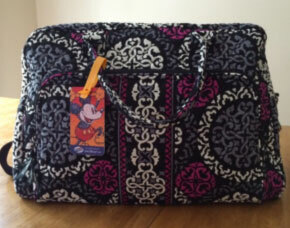 Pack a carry-on bag: Many people travel by plane to Walt Disney World. If you are flying, it is imperative that you pack your running essentials in your carry-on bag. It is a huge inconvenience to have an airline lose your luggage. It’s worse if all of your broken-in race day gear is in your checked bag. This is entirely avoidable by keeping those items with you. The fact that running gear is very compact makes this a simple task. Be prepared for the Expo: Packet pick-up for a runDisney race is held at the race Expo. A signed race waiver is required to receive a bib. I like to print my waiver from home and bring it already completed to the Expo. Time saved in line equals more time for shopping, which reminds me of another tip: bring extra spending money for the Expo! There are always lots of vendors with various running related merchandise. My favorite booth is the runDisney one! They have exclusive items for each race including t-shirts, pins, magnets, shoes and much more. Quantities are limited so go early! 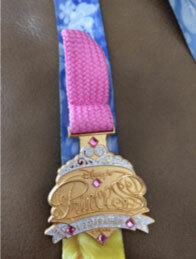 Expo exclusive replica medal pin, so cute! Go hands free: Wear a running pouch to keep everything in place. There are a variety of options available depending on what suits your needs. I use a very basic belt that is just a small, stretchy pouch. I put my phone, ID and energy gels inside. It also has toggles to fasten my bib to it, eliminating the need to pin it to my shirt. Make sure you wear your belt during training for maximum comfort. 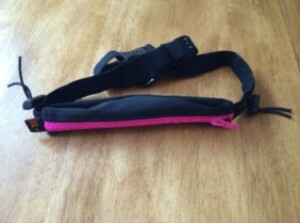 My Spibelt . You really can fit a lot inside! Wear the right gear: Whether you are running a 5k or a full marathon, having broken-in running gear is a must. Race day is not the time to try out anything new! Make sure your shoes, socks, underclothing and outfit are all items you have been training in for at least a month. I love to rock my Disney side during a race! I actually wear my costume on several test runs prior to the race, even though I look a bit Goofy! This gives me time to make necessary adjustments if anything causes discomfort. I cannot tell you how many tutus I’ve seen that were abandoned by uncomfortable runners lining the race course. Finish your race in style by starting in comfort! Take lots of pictures: The fabulous entertainment provided during a runDisney race is what makes them stand out from other races. Don’t miss out on the great photo opportunities by forgetting your camera! Almost all smart phones are equipped with cameras that are easy to use and take great pictures. If you don’t have a smart phone, just bring along a pocket sized point and shoot camera. Either one should fit easily in your running belt. Utilize bag check: Some additional gear I need includes an anti-chaffing stick, sunscreen, a GPS watch, a water bottle, energy gels or chews, sunglasses, and hat or visor. Sometimes I even want a change of clothes and shoes for after the race. Bag check is great place for all of these extras! I leave any items that I don’t want to carry with me during the race at the bag check. For added convenience, there are first aid and water stations located throughout the race course. You will find Tylenol, Vaseline, Bio Freeze, band aids, water and Powerade available as needed. No need to bring any of that along. So there you have it! 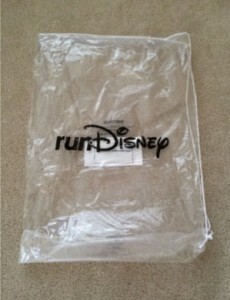 These are the tips I have found most useful during my runDisney races. Combining a good training program with an organized packing strategy will result in a magical race experience. But when the inevitable time comes to pack for home, I always leave my race medal out of the luggage. I want to show off my achievement for all to see! Wear that fabulous piece of bling around your neck with pride! You earned it, you ran Disney! Welcome to the MouseQuest Podcast- Your guide in the quest for the perfect Disney vacation. This is a special episode featuring an interview with MouseQuest’s own Rich Grady. This year, Rich completed the runDisney Dopey challenge, and so we asked him to share his experiences with us. Congratulations Rich! Appearing in this special episode are Rich Grady and Marci Smith. Welcome to the MouseQuest Podcast- Your guide in the quest for the perfect Disney vacation. This is episode number 44. This week on the show we will hear all about runDisney’s Tower of Terror 10 Miler from one of the thousands of runners who participated in this exciting event. Dawn was able to complete this race and enjoy the Hollywood Villains Bash afterward. We look forward to hearing all about it. The Tower of Terror 10 Miler began its inaugural year in 2012 and instantly became very popular. It is unique in the runDisney universe as a 10 Mile Nighttime race through Disney’s Hollywood Studios and ESPN Wide World of Sports. Disney villains can be found along the course, which is made up of various terrain including grass, pavement and sand. In addition, we also answer a listener question regarding construction activity as the Polynesian Resort. Appearing this week are Dawn Gosdin, Rich Grady, and Marci Smith. As a person who has visited the Disneyland Resort numerous times, what would you say are your top 5 Must Do Attractions in Disneyland And California Adventure? As a person who has never visited the Disneyland Resort, what 3 attractions are you most looking forward to experiencing? You have not yet had the opportunity to visit Southern California, but when you do, what are you most looking forward to experiencing in California Adventure? As a runner who has experienced the best of what runDisney has to offer on the East Coast, what events would you like to experience out in Disneyland? How do you think the experience would be different? As a WDW veteran myself, one of the things that I love to do there is eat. Can you give us your top 5 choices for having a great dining experience at the DLR? We all know you love to stay in Disney Resorts in Florida, where do you think you’d like to stay when you visit Disneyland? All of us are very familiar with the great caliber of entertainment that Disney offers in their parks. Whether you enjoy shows, parades, fireworks or street performers, there is a lot to see and enjoy. If you had only one day to visit Disneyland and California Adventure, which entertainment offerings would you be sure not to miss? As a parent to two younger children, what are you most looking forward to experiencing in the West Coast Parks as a family? Appearing this week are Dawn Gosdin, Rich Grady, Amy Leto, Heather McGilvray, and Marci Smith. For our listeners who do not have any experience with runDisney, what is an overview of what runDisney is? Throughout the year in both Disneyland and Walt Disney World, runDisney puts together some amazing events. What are for Florida as well as California? Are runDisney races only for experienced runners? Are walkers allowed? Once someone decides they want to participate in a runDisney event, where can they register? What is included in the cost for registration? What can a runner expect to see and experience along the course? For beginning runners, What are some tips about running etiquette? If family and friends of a racer don’t want to participate in the event but do want to watch or cheer them on, how can they do that? Are you allowed to wear costumes in a runDisney race? Are there any restrictions? What are the Top 5 Tips for someone who is looking to get into it? Appearing this week are Dawn Gosdin, Rich Grady, Rhonda Hare, Amy Leto, and Marci Smith. To submit a question please go to the MouseQuest Podcast website.